Bozzano Olive Oil – the freshest, certified organic Extra Virgin Olive Oil, exclusively at Kanon Gallery. The Bozzano family has a history of farming in California dating back more than 4 generations. 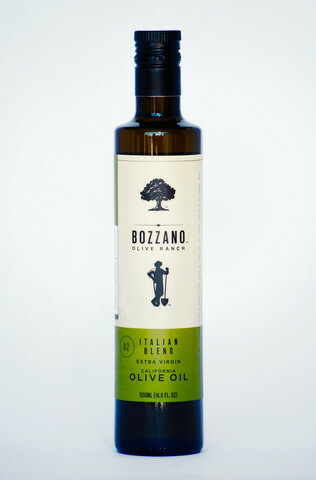 It began in Italy, where the small family farm produced olives and olive oil for the community. When 15-year-old Lino Bozzano emigrated to Stockton, CA, he brought that tradition with him. He planted tomatoes, founding what would in time become the American branch of the Bozzano family farm. In later years, the Bozzano family replaced their tomato crop with cherries, and in January 2007 the focus switched again to olives and olive oil. In four generations the Bozzano farm has come full circle, from a small olive farm in Italy to the expansive olive ranch it is today. Bozzano is the MOST AWARDED organic olive oil producer in the Nation. With 36 total awards in 2015! Our highest polyphenol count oil this year!